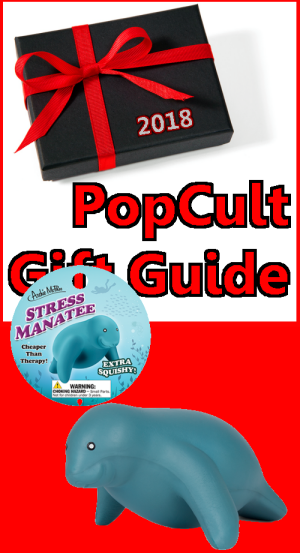 Next up in The 2018 PopCult Gift Guide is a great little gag gift that’s perfect for the stressed-out person on your holiday shopping list who enjoys the idea of mangling manatees. The Stress Manatee from Archie McPhee is under ten bucks, and will let you take out all your aggression on this sweet, gentle, harmless endangered species. At this price, it’s a good stocking stuffer. This manatee feels as squishy as a real manatee looks. Manatees have got it made. Constantly floating in warm water, not having to care how they look. Watching them makes all your stress melt away. Now you can get rid of all your anxiety by squeezing this soft polyurethane foam 5½” squishy while you read the affirming poem on the back of the package. I like to put the manatee on my shoulder and pretend that it’s whispering relaxing things to me. After all, a good manatee is hard to find and this one is a great one! What you get is a A squishy manatee, 5-1/2” long, that you can squeeze and squeeze and squeeze in a relaxing, soothing and calming manner. It takes over 9 seconds to pop back into shape, which, if you know your stress manatees like I do, you know that means that this is one ultra-high-quality squishable mammal. The folks at Archie McPhee have even created a video to show the Zen-like reclaimation of form by the Stress Manatee. See it at the bottom of this post. You can order the Stress Manatee directly from Archie McPhee, or you might luck out and find it at one of the stores that carry Archie McPhee products (like Taylor Books, in Charleston).